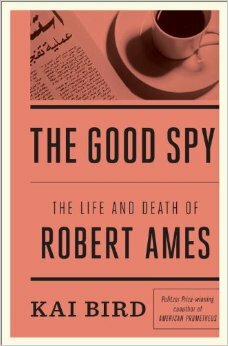 Recently, I received an advance edition of The Good Spy: The Life and Death of Robert Ames by Pulitzer Prize-winning author Kai Bird. This book was different and it was by no means a novel. It was raw and captured some of the most important events in the Middle East of the past fifty years through the eyes of a real CIA agent. In its description, The Good Spy is Pulitzer Prize-winning biographer Kai Bird’s compelling portrait of the remarkable life and death of one of the most important operatives in CIA history – a man who, had he lived, might have helped heal the rift between Arabs and the West. His name was Robert Ames and his time with the CIA spanned from the 1950s to the 1980s. I loved reading the The Good Spy for many reasons. First, it was a terrific narrative about the making of a CIA officer and it provided a terrific context of the twentieth-century Middle East conflict. Second, it revealed a different kind of spy that I did not know exists. What I appreciated most about Robert Ames was how different he was from what movies portrayed about spies. When we think of spies we think of James Bond, Ethan Hunt, or Jason Bourne and the destruction that they created. Although those fictitious agents are entertaining, I can imagine they are far from how things actually get done in the espionage world. Robert Ames was a clandestine CIA agent, which meant that his job was to do business as unnoticed as possible. Robert Ames is one of those spies who got things done. He possessed a quality that none of this type had: Patience. In the description of Ames, the distinction of his patience stood out in the book’s narrative. Impatience is something in my life that I struggle with and I suppose we all do in some way or another. We live in a “electronic-now” post-modern culture and we are losing the ability to approach life at a pace. Ames’ patience is what made him unique and probably so successful as a spy. I am thankful for Robert Ames’ life and I believe that his legacy to us is more than just how Middle East policy is upheld today. Patience recognizes other people’s perspectives: Ames was a ferocious reader and student of the culture he worked within. He also understood that by taking the time to listen to people meant that he would be able to gain a deeper understanding of everyone’s plight, whether Israeli or Palestenian. His patience garnered better intelligence. For me it is a reminder about the importance of taking time to listen to people, especially people who are different from me and to better understand their point of view. Patience welcomes criticism: Ames was criticized for not signing up his key asset as a paid ones so the exchange was more official by the books. Instead, he focused on building a trusting relationship that would provide better intelligence rather than a quick purchase of information. Some within the CIA felt Ames was not strong enough to do this but Ames believed in this, ignored the criticism and found success over time. Patience looks beyond ourselves: Ames believed in peace in the Mideast. Tragically, he was killed before he could see more progress. Ames knew the risks of being a CIA officer and operated in a way that looked at the big picture because with how complex and difficult Mideast peace would be to obtain. He knew that it was unlikely for his own eyes to see this happen as it could take lifetimes. This is also a lesson of faith. Patience displays humility: Robert Ames as a clandestine agent was not looking to be noticed. He knew if he ever did anything amazing, very few if any people would know it. Ames wanted to move up within the CIA but he also knew that what mattered most was getting the job done no matter who received the credit. Patience is Biblical: From what I read Ames was a great family man and a strong Catholic. It seems like his faith got him through some of his toughest times. Patience through the Bible’s lessons were ingrained in him and I can imagine him reading these verses to be encouraged during his service. I hope to see Robert Ames one day again in heaven to thank him for these great lessons. Do you struggle with impatience? How do you handle it?